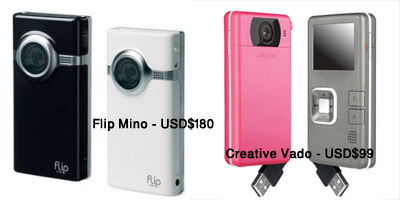 It has been less than a month since Creative announced its entry into the pocket video cam market with the Creative Vado and now, Pure Digital Tecnologies (the company which produce Vado's closest competitor, Flip Ultra) have released a new and updated player - the Flip Mino. The timing of its release can only be seen's as Flip's head-on fight with the Vado. The Flip - although unheard of in Asia - is pretty popular in the US. What's more incredible is that the Flip stole a whooping 13% market share of the Camcorder market directly under the nose of Sony and JVC. Could the Creative Vado offset Flip's position in the pocket video cam arena? Physically, the Vado is a little smaller and lighter than the Flip Mino. It also has a larger screen (2" compared to Flip's 1.5") and cost about half the price of Flip. Performance wise, the Vado is able to squeeze 120 minutes of high quality recordings into its 2GB inbuilt memory while the Flip can only manage 60. What might sway consumers onto Vado's camp is its removable, rechargeable battery. Creative's Vado is obviously targetted at the trigger-happy-blogging generation. It is cheap, handy and provides a really convinient and easy way for people to express themselves. The Vado might very well be Creative's next hit product after its soundcard and Portable Media Player instead of the Company's inPerson. The Creative Vado will debut at the PC SHOW 2008 in Singapore on the 12th of June 2008. It comes in hot pink and silver and cost SGD$169.